Does anybody know if the photo on the cover of the "Legend" CD is Peter? If so, is there a version available where the head is not cropped? Remember the "Last Train To San Antone" CD that features a guitar player without the head. And when you flip it, our Greeny is revealed! It's rather unlikely that Peter was photographed at the time "Legend" was released (1988), but could it be an archive photo from the beginning of his PVK era?? Anyway, my question is: Has anybody seen the complete photo on "Legend"? 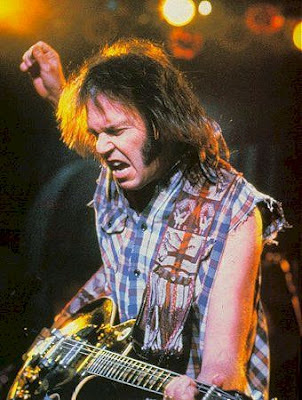 tell you what, dansven: if you google "neil young" and check out the variety of pictures of him there - he's been wearing these checkered shirts all over the place. and ain't this exactly young's black les paul with the bigsby? 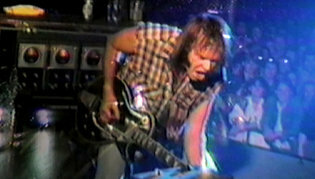 as long as someone doesn't come up with the picture in its entirety, my money is on neil young here! Looks like you're correct, lazy poker! thanks so much, sharky - this has got to be the shirt in question . . . and the guitar . . . and, er . . . peter green! Wonder if Young is aware of this.....? And the copyright owner, who is, presumably, the photographer who took the image .